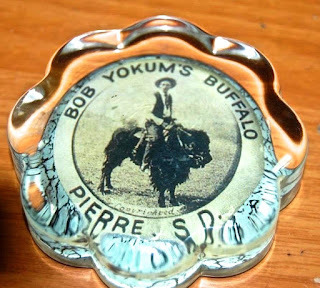 The glass paperweight at left bears the photograph of a man riding a buffalo and bears the legend: “Bob Yokum’s Buffalo, Pierre, S.D.” It provides a window into the feats of a South Dakota saloonkeeper in training buffalo — the American bison — to pull a wagon or sleigh, be mounted and raced, and, most famously of all, engage in bullfighting in Mexico. Details of the saloonkeeper’s life before settling in the Dakota Territory are sketchy. 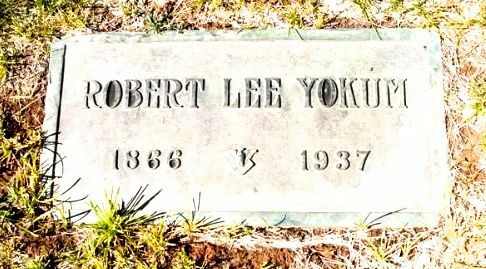 According to 1870 census records, Robert Lee Yokum, shown here in maturity, was born in California in 1866. His father, Dennis, was a carpenter. After his wife died the father initially was dependent on an older daughter to keep house and care for younger siblings. After a move to Archer, Texas, where he was recorded working as a blacksmith, Dennis Yokum married a woman almost half his age and started a new family. 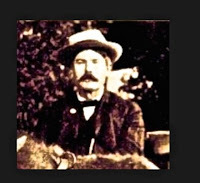 Bob was recorded as still at home in 1880, working as a laborer, but soon left for other adventures. Details of his next few years are scant. 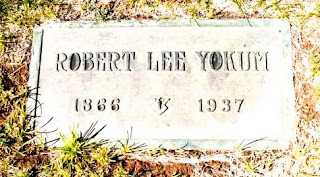 Yokum is said to have engaged in “the old ranching and cowboy life of the American West,” eventually becoming a United States marshal and gaining the title “Major.” This rambling did not deter him from an early marriage. In 1890, at age 24, in Callahan, Texas, Bob wed Inez Coppins, a Michigan-born girl who was only 15 years old at the time. They had two children. 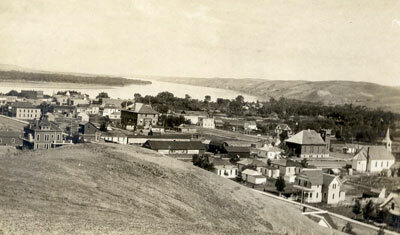 The 1900 Census found the family living in Ft. Pierre, South Dakota, shown below. Yokum’s occupation was given as “drayman” — the driver of a flatbed wagon, called a “dray,” pulled by horses or mules. Beer frequently was hauled on drays, a cargo that might have brought Yokum in close contact with the saloons of Ft. Pierre and neighboring Pierre, the state capitol. 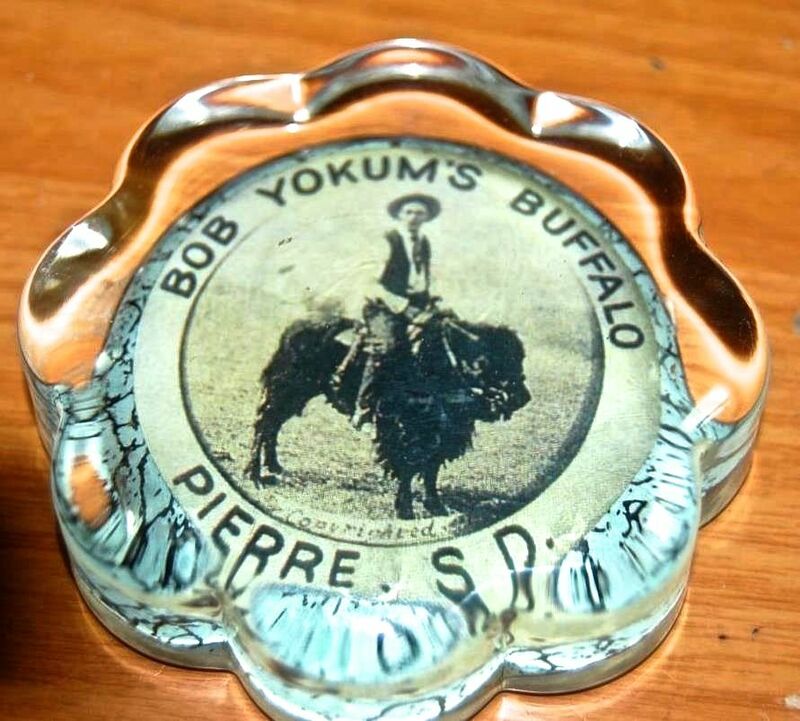 Blessed with a good business sense, before long Yokum was reported to have owned at least two such establishments. Unfortunately I have been unable to discover their names but believe one was the “Buffalo Saloon,” as suggested by the paperweight that opens this vignette. The American buffalo for years was considered untameable and many biologists considered it as one of the most stupid animals in existence. That did not deter Bob Yokum, drawing on his experience with horses and mules, from experimenting on his ranch to see what they could be taught to do. 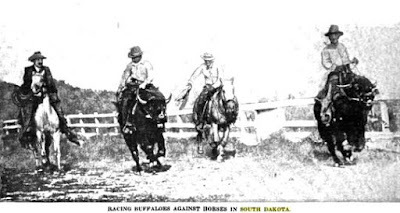 “His troubles and trials with the unwieldy bison were innumerable,” noted one writer. 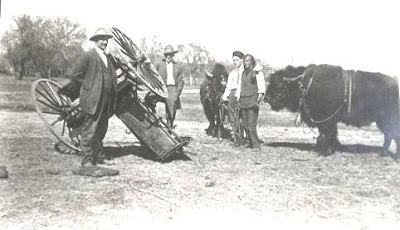 A photo below of a smashed wagon with onlookers and a pair of buffalo standing by lend credence to that view. Eventually, however, Yokum succeeded in breaking them to a harness and driving them as a team. 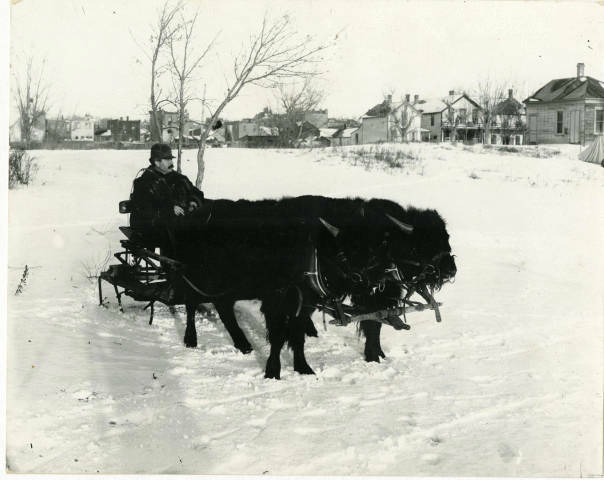 Shown here, Bob’s bison are pulling a sleigh, with the saloonkeeper at the reins. 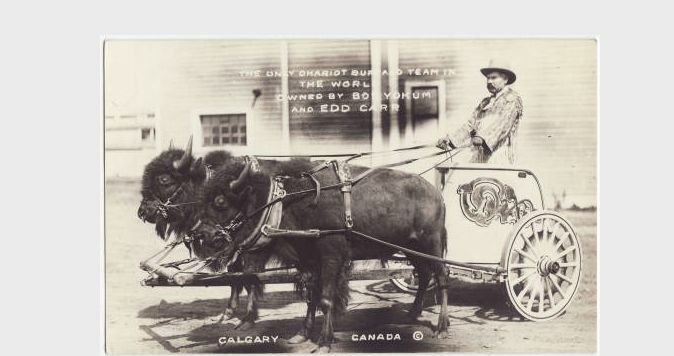 As the fame of his accomplishment spread, Yokum was invited to participate in the annual Calgary Stampede, a showcase of Western motifs. For the occasion in Alberta, Canada, Yokum hitched his team to a fancy chariot. A postcard shows Bob in the role of Ben Hur. 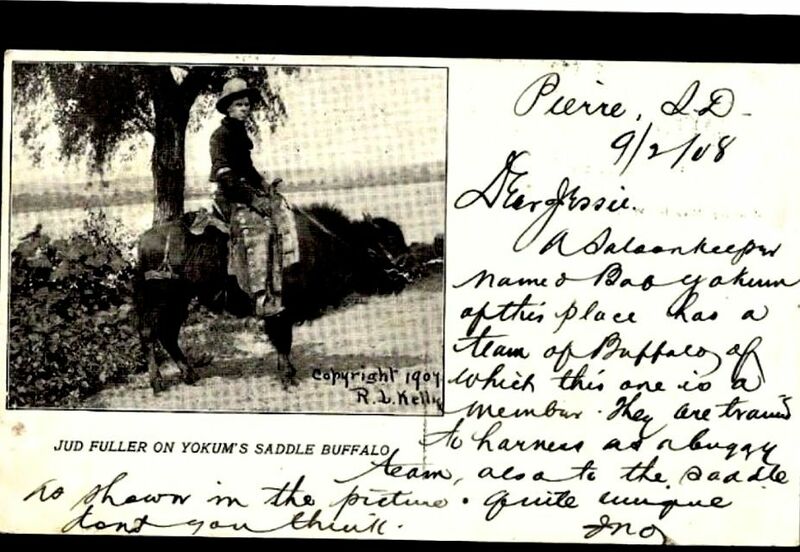 Yokum’s next feat was training his buffalo being to be ridden. They were said to “loathe” the saddling process and upon being mounted for the first time were known to buck fiercely trying to throw the rider. With patience, the saloonkeeper was able to accustomed the shaggy beasts to a passenger, as shown on a postcard. In addition, he was able to race them, both against other bison and against horses. They beat the horses. Sequentially, attendants released four more bulls into the ring, each time to the same result. 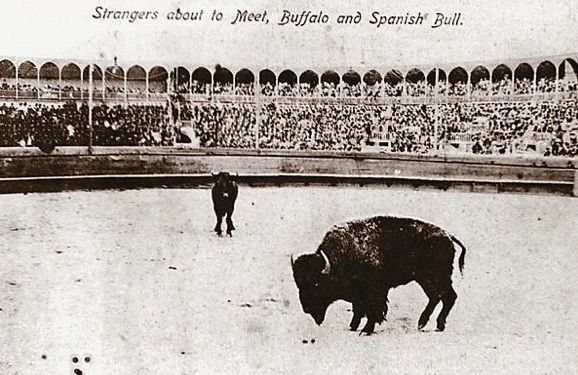 The buffalo defeated them and ended up chasing them around the ring as the Mexican crowd shouted their approval. 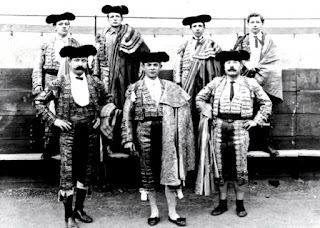 Their point made, the delegation donned matador outfits for a triumphant photograph. Yokum is front right. Several days later the delegation entrained back to South Dakota but without the buffalo, claimed by the Mexican promoters for an uncertain fate. 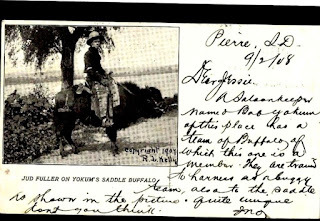 Yokum went back to his buffalo farm and to operating saloons in both Pierre and Ft. Pierre. When the latter town under “local option” went dry about 1910, Bob clearly was distressed and upon subletting his building included a provision banning anyone else from running a saloon there if the laws changed. In fighting a court challenge to the provision, his lawyer explained: “Mr. Yokum had been conducting a saloon in this building and this saloon business always was a touchy affair….He is praying for the time when Ft. Pierre will again become wet and he can again run a saloon there.” No indication exists of that having happened and by 1917 the entire state of South Dakota had banned alcohol.